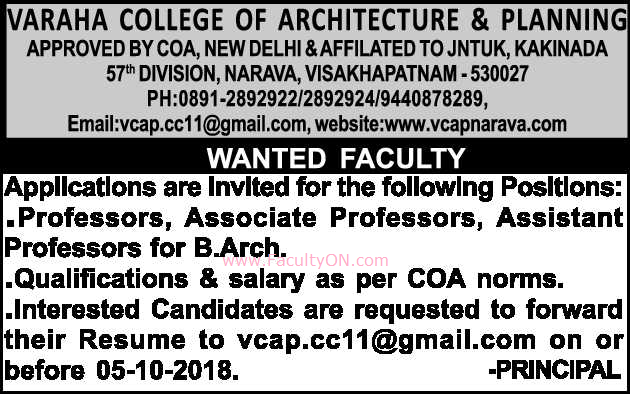 Varaha College of Architecture and Planning, Visakhapatnam has advertised for the recruitment of Teaching Faculty- Professor / Associate Professor / Assistant Professor jobs vacancies. Interested and eligible job aspirants are requested to apply on or before 05th October 2018. Check out further more details below. About College: Varaha College of architecture & Planning (VCAP) service as the voice of the students to the educational system and profession of architecture and design. The goal of this grassroots association, which is affiliated with JNAFAU/ JNTUK and approved by POA, New Delhi is to build interest and enrich the educational experience in architecture and design.